Lindsay Lohan's younger sister Ali Lohan's new face shocked the world when her before-and-after picture surfaced, going viral this week. Slimmer nose, fuller lips, gaunt face, tightened skin, botox? "Absolutely not. She's 17. I don't really believe in plastic surgery for young girls. Some do, but I don't," her mom told talk show host Wendy Williams. Her mom said that she's grown three-and-a-half inches over a couple of years, and that she eats more than she and Lindsay combined. "She's taller than Lindsay and I; she's a giant," her mom said. While her family, her modelling agency Next Model Management L.A., all deny the model has had any work done, Dr. Robert Rey told E! 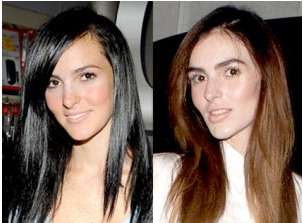 Online that it is, indeed, a possibility that Ali Lohan had plastic surgery. "It does appear as if she may have had a rhinoplasty because in her photos now, her nose appears narrower and the tip more defined." Dr. Rey told E! Online. Rey, a plastic surgery specialist, was at the 2011 Miss Universe contest looking at the world's top beauties over the week. And what about her older sister Lindsay's lip injections? Her pout looked a wee bit fuller post-jail. The family dismissed those rumours, too. “It’s what most people refer to as the awkward stage. Ali is growing up, that’s all," Ali's rep told People Magazine. “Aliana has never had any type of plastic surgery in her life nor has she ever considered it. Her success as a model lies with her natural looks and she has no interest in changing that. During the past two years, she has gone through a normal teenage growth spurt that has made her taller and slimmer." "I love how haters pick on my sister yet every runway model is just as thin! My sister is gorgeous and I'm so proud of her and her career!!!!" Lindsay tweeted in angry defense of her sibling. Adolescent growth spurt or plastic surgery? What do you think? Screen starlet Scarlett Johansson was also accused of going under the knife, a rumour which she denied.